Today's mission is to place a clothes hamper, basket or bag, or two, where they're needed around your home to collect dirty laundry. 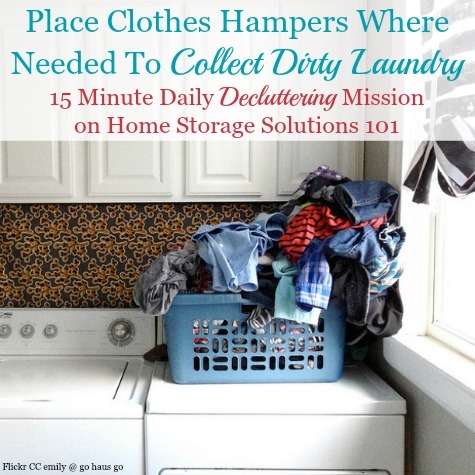 This mission is designed to be done when working on the Laundry Organization Challenge here on the site, which is part of the 52 Week Organized Home Challenge. On the surface this seems like a pretty easy and perhaps even silly mission. Who doesn't have a laundry basket already you ask? Well just hear me out, because I have heard from a lot of people who feel overwhelmed by laundry, and never feel like they're caught up with it. And whenever we really delve into the steps of the process we almost always discover an organizational stumbling block, and not having an adequate number of laundry hampers, and in the right places, is frequently one of them. There are others stumbling blocks as well (such as putting away clean laundry, which is a topic I discuss in another article) but if you are struggling with keeping up with laundry make sure you evaluate this step of the process to see if you can make improvements in this area. Below I've asked some questions to get you thinking about what your current laundry collection set up is like, and also what you could do to improve it in the future, along with giving tips for what I think is ideal or at least should be considered for different situations. Where Are Dirty Clothes & Laundry Going If There's No Designated Place For Them? Everyone creates dirty laundry with the simple process of wearing clothes, and the key is to get everyone to place the clothes in a convenient place for the person (or persons) doing laundry to be able to grab them and get them washed. If they're not in a container, then they may be, for example, laying on the floor, potentially mixed in with the piles of clean clothes. This makes it difficult to tell which type of clothing is which, and to just grab a load and wash it when you have the opportunity. In addition, if you have a place everyone puts the dirty clothes, but it isn't in a container, it can look overwhelming. For example, putting all the clothes by the washing machine is a good first step if there's space for them there. But if, like a reader, Susie, who sent in the photo to the right, there isn't actually a container to hold them, or even space for a basket or hamper in that area, all the dirty clothes become clutter that is stressful and also can be a tripping hazard. In fact, Susie lamented in her comments that accompanised the photo that it was especially difficult to deal with this mess on the floor now that she was on crutches. I'd say so! Another advantage of keeping all dirty clothes in a clothes hamper or similar container is that if you fill up hampers or bags as you go, you can visually see how often you need to wash clothes by how quickly the baskets are filling up as things are used. It is frustrating to have a mostly empty basket and think you've got plenty of clean clothes left, and then realize all the dirty laundry was collected somewhere else and you should have done laundry probably two to three days earlier than you did it! 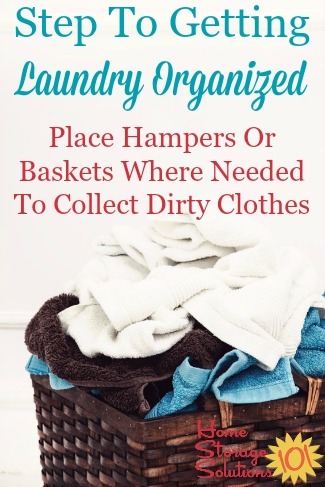 For these reasons actually having a designated spot for dirty clothes is the first step in getting things organized and creating a better system for laundry in your home. Where Should You Place Hampers? I hope I've convinced you that you need to again look at where you've placed clothes hampers around your home as part of this mission. Next you need to decide where you'll place the baskets or hampers in your home. One question you need to ask yourself is whether your hampers should be centrally located in one place, so everyone's laundry is gathered up together, or in many locations, so that it is more convenient for everyone in the household to drop their dirty clothes into them? There are pros and cons to each method, and I don't think there is a right answer. It just depends what works best for your household. The pros of having it all centrally located, like a reader, Kristie, does in the photo on the left, is that it is easy for the person doing laundry to see what laundry there is to do, and already have it in one place when there's time to do a load or two. 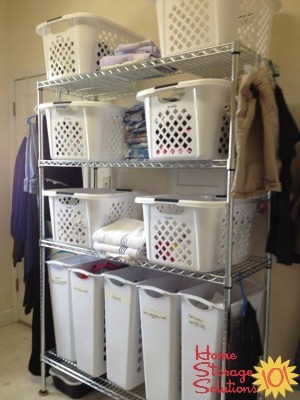 Kristie explained, "It took me 25 years and so many different laundry baskets to finally get the perfect system in my house. Baskets on shelves are for folded clothes, each person in the house has a basket. Hanging clothes ready for the closet are hung on the side of the rack next to each persons basket. Dirty clothes are on the bottom. Labeled for sorting. This simple thing has CHANGED my life!!!" It's amazing how just placing baskets and hampers in the right place can change your laundry life, but it really can! The cons of a centrally located system include that it is not as convenient for household members to drop their clothes into a basket. That means you might still see dirty clothes on the floor or collected in a pile somewhere else if you can't get them to develop the habit of consistently taking them to the central collection point. 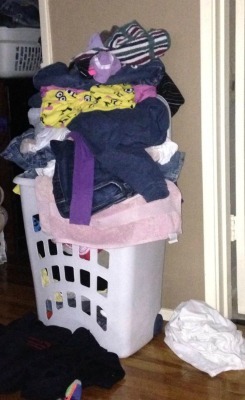 That's why some people find it easier to have lots of laundry baskets around their home. They are working with the habits of family members, and putting a hamper or basket where that person already drops their clothes anyway, to hopefully containerize it, instead of having the mess. The con of having dirty laundry collection points in so many locations is that you have to then go around to many locations to gather dirty clothes when it is time to do laundry. It may be worth it though, depending on the habits of certain members of the family. 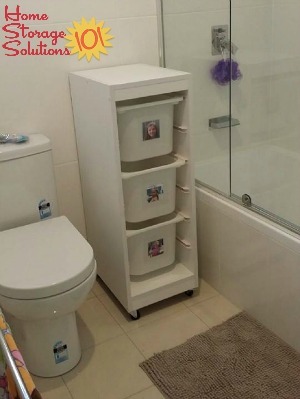 Should You Have A Clothes Hamper In The Bathroom? From a purely logical standpoint it makes sense to have a bathroom hamper where people can deposit dirty clothes as they take them off to bathe or shower. It is quite convenient, after all. That is exactly what a reader, Kelly has done, as you can see from the photo on the right. She's chosen to sort her laundry by person, not by color, and to have the sorters in the bathroom. I will caution, however, that I don't actually recommend keeping laundry sorters or hampers in the bathroom because the area often stays damp and humid. Because of this it is harder for clothes to dry in there, and damp clothing can more easily mildew which can be a laundry nightmare. Only you know how prone your bathroom is to excess moisture so just keep it in mind, and then make a decision for yourself whether you'll place a container in this room. 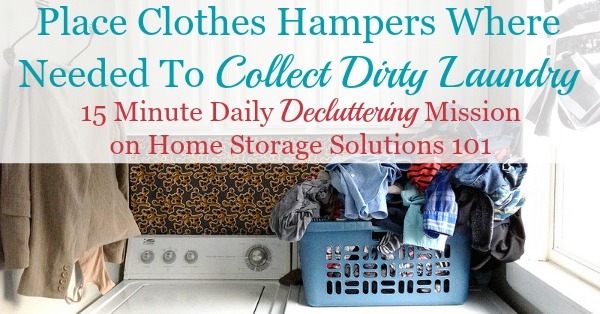 Most of this article focuses on your considerations for where to place clothes hampers, or similar containers, and the reason is obvious -- we dirty a lot of clothing with daily wear. However, don't forget when deciding where to place laundry bags and baskets that clothing isn't the only thing that needs to be washed. 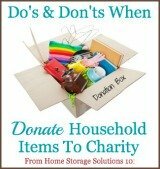 You need to make sure you have a place to collect other items as well, such as bath towels, wash cloths, kitchen towels, and bedding as well. What Type Of Laundry Containers Should You Choose? Finally, once you've decided where to place your dirty laundry containers, you've got to make sure you choose the right one for the job. Again, this isn't rocket science and there is no right answer, plus you can make do with what you have most of the time, at least until you can upgrade to something more effective when you have time and money. I would seriously suggest at least considering containers that allow you to sort as you go though, such as laundry sorters, or multiple baskets or compartments in a basket, such as some of the ones I've shown above. If you like to wash one person's clothes at a time, make sure you've got a way to sort the clothes that way in the containers, or if you like to sort by color or type of fabric, or whatever, have your containers allow sorting in that way. Sorting as you go helps you eliminate a whole step in the laundry process, and just take basically the whole container and dump it straight into the washing machine. Ahhh. It makes it so much easier, I promise! The size of the containers you choose is also important. The photo to the left was provided by a reader, Tracy, who was lamenting about not being able to keep up with her laundry. I definitely know that feeling! My ideal sized container is one where I can eyeball it when it's full and know that is basically equivalent to a nice sized laundry load in my washing machine. You don't want containers that are consistently overflowing like Tracy's, just because it looks chaotic, and therefore makes you feel more stressed and overwhelmed. So don't choose containers that are too small for typical volume if possible. Unfortunately, an overflowing clothes hamper may just indicate you need to do laundry more frequently, since the solution isn't always to buy bigger and bigger hampers, although sometimes that does sound nice, am I right? Hopefully these questions and considerations will help you evaluate your home's current set up when it comes to where you've placed laundry baskets and hampers, and maybe tweak or rehaul your system if it isn't working as well as it could. 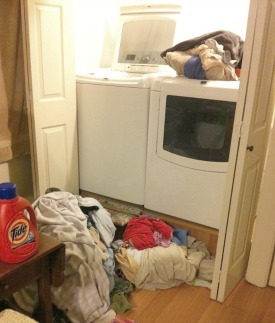 This can be a quick and simple fix, but yet reap big rewards for you in the ease of getting your laundry done!